I²C (aka I2C, IIC) is a bus commonly used for interfacing integrated circuits to microcontrollers. In this article I will connect several EEPROM chips using I2C, first to a Bus Pirate for prototyping and testing, then to a Raspberry Pi 3 single board computer, using python-smbus to read and write the EEPROMs over the i2c-1 bus. Then I’ll move one of the EEPROMs to Raspberry Pi’s other I2C bus i2c-0, using ID_SC and ID_SD pins, for possible usage in a HAT (Hardware on Top) add-on board. Before bringing the Raspberry Pi into the equation, I first started experimenting with I2C using a Bus Pirate. 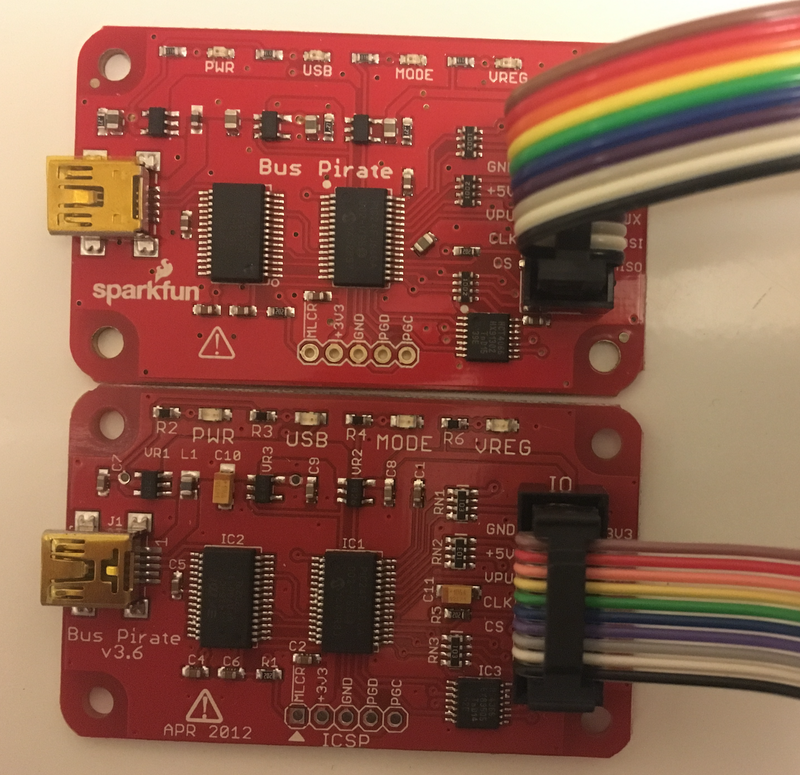 Not strictly necessary, but the Bus Pirate is a very useful tool for prototyping low-level hardware communication interfacing. 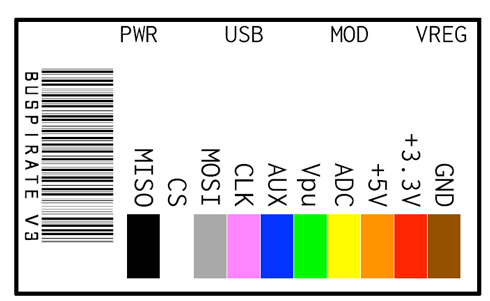 You can use it on any system with USB — it connects as a USB-to-serial device to your computer (thanks to the onboard FTDI chip, TODO: possible to connect the Bus Pirate v3 to the host computer using serial instead of USB, like on the Bus Pirate v1 and earlier which were serial-only? Bus Pirate v2go had a serial terminal (ST), an “unpopulated header is a tap into the UART connection between the PIC microcontroller and the FTDI 232BL chip that provides the USB connection”, but what about v3 or later? 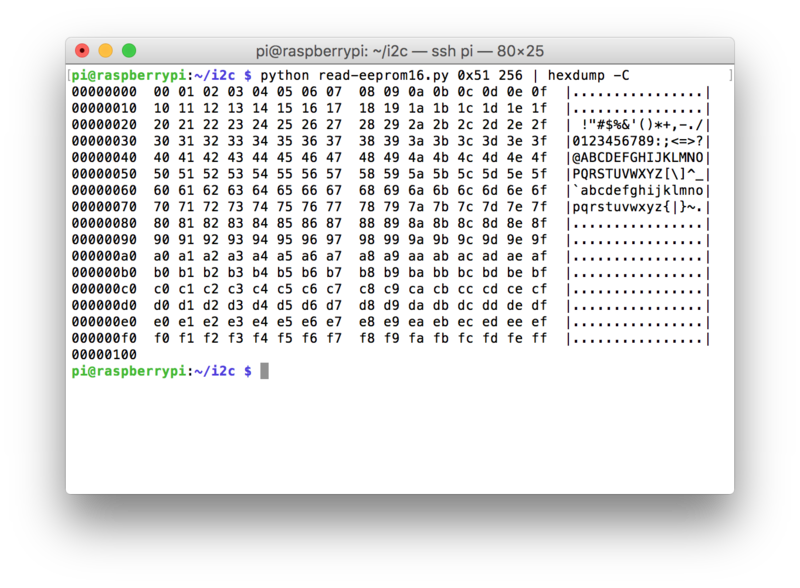 ), on a Mac connect using `screen /dev/tty.usbserial* 115200`, or on the Raspberry Pi: `screen /dev/ttyAMA0 115200`. There is also a Bus Pirate v4 in development, started in ~2011, comparison wiki page last modified 2012, still marked as “experimental”, so I went with the the v3 model instead for now. Sparkfun’s cables include thinner wire, feels cheap, with smaller fragile female connectors. Seeed’s female connectors are robust and — crucially — labeled! 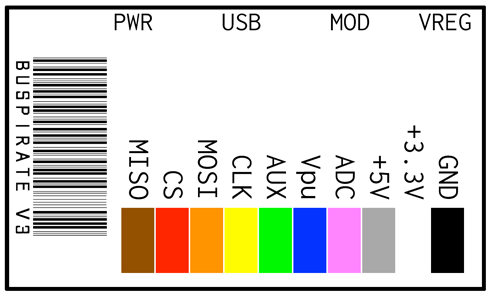 (if you get the “probe cable with labels” item) This is quite handy, I much prefer the textual labels over decoding the wire color codes (reminiscent of resistor color codes, before I learned of multimeters). except my cable from Sparkfun was not reversed (i.e., MISO was black not brown). Also confirmed by shorting orange (+5V) to yellow (ADC) and reading the voltage with ‘v’, ADC reported 4.98V, confirming the pinout above, not the “reversed” pinout. I initially wired up the cable to the chip incorrectly due to this misdirection, fortunately the electronics survived, as far as I can tell no damage was sustained. For these reasons, long story short, I prefer the Seeed Bus Pirate over the Sparkfun, or at least the Seeed cable. Labeled leads, higher-quality wire and connectors, no reverse-facing cable direction, it’s easier to work with. However, they are both functionally equivalent in a pinch. There are plenty of interesting I2C devices on the market, just search for “I2C” on Adafruit or Sparkfun. For this article I will be using a couple serial EEPROMs from Microchip since I had them readily available. To use with the Bus Pirate, connect Vcc to 5V or 3.3V (because the chips can handle 2.2–5.5V, either power supply is acceptable), SCL serial clock to CLK clock, SDA serial data to MOSI master output slave input, and Vss to GND. Also connect the Bus Pirate VPU (voltage pull-up) to Vcc. This is with the 24LC512 chip. 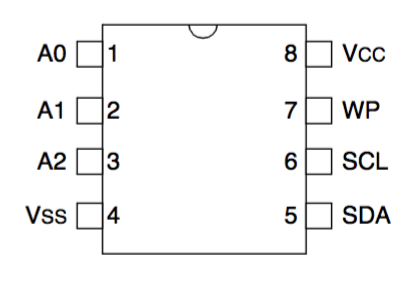 To use the ‘515, we must learn about the purpose of the A0/A1/A2 pins. On the ‘512, these pins set the lower bits of the I2C device address, fairly straightforward. 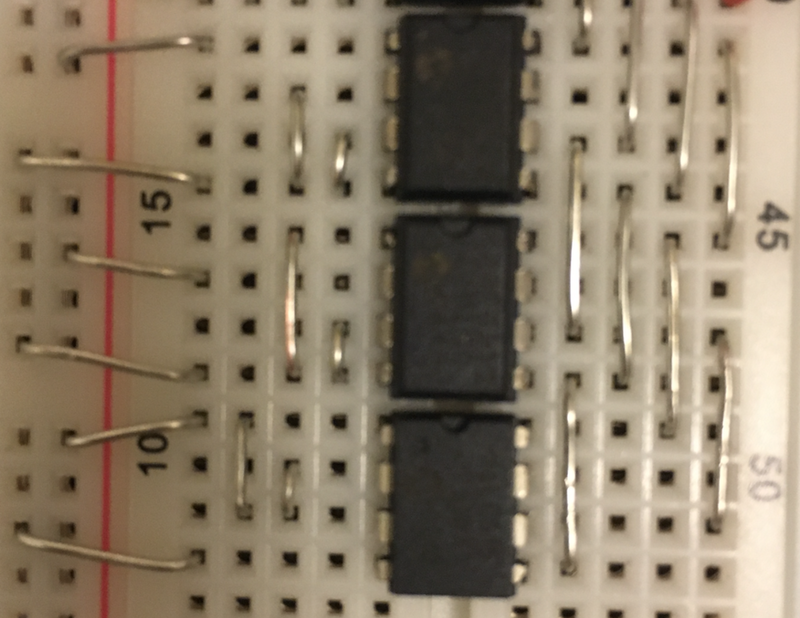 The upper bits for these EEPROM chips are fixed at 1010, but you can select the lower three bits by tying A2, A1, and A0 to Vss (0) or Vcc (1). If left floating, they will default to 0, but grounding is best practice. The ‘515 introduces another bit in the I2C address, “B0”, to select the “block”, which “acts as the A15 address bit for accessing the entire array”. What would be A15 is actually a don’t-care (X) bit in the ‘515. The device is at 0x50 = 0b1010_000, which means the write address is 0x50<<1 = 0xa0 = 0b1010_0000, and read address (0x50<<1)|1 = 0xa1 = 0xb1010_0001. Assuming A2-A0 are 0, that is. If A0 was 1, then the device address would be 0b1010_001 = 0x51, with write at 0xa2, read 0xa3, or if A0 and A1 and A2 were all 1, then 0b1010_111 = 0x57, r 0xae, w 0xaf, and so on. since the full 512Kbit memory address space is available at the same I2C device address. Why Microchip introduced this complexity with the 24LC515, who knows, but the design of the 24LC512 is much more logical and straightforward. The 24LC515 is “no longer recommended for new designs”, so although I was able to use both chips successfully, I’ll use the 24LC512 in the examples below, at the default address of 0x50. Notice how two bytes (0 0) are specified for the 16-bit address, as these are 16-bit serial memory devices. Smaller memories like the 8Kbit 24LC08B may instead use 8-bit addressing, requiring only one byte for the address above. Note that only 16-bit serial EEPROMs are supported by the Raspberry Pi HAT specification and they cost about the same, go with them if you can. Finally, let’s wire an I2C device to the Pi. I used an EEPROM I wrote in the previous section with the Bus Pirate, but any I2C-compatible chip should do. Similar to Bus Pirate’s “(1)” macro (I2C 7-bit address search). Although i2cdetect only shows the 7-bit address, unlike Bus Pirate’s scan which shows both read/write addresses, they can be derived from one another. 0x50 of course corresponds to 0xa0 write, 0xa1 read. Sporadically returned “Error: Read failed”, but sometimes 0xff (correct). Frequency? 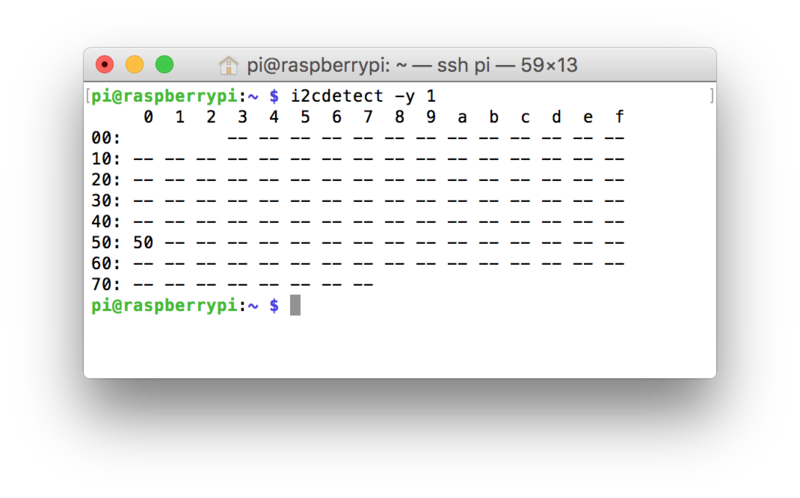 python smbus/i2c frequency says there are low-level registers to control the frequency, but Pi’s driver resets them on every use. Use another library? BV4205 with a Raspberry Pi references a Quick2Wire i2c-python library from 2012. GitHub quick2wire/quick2wire-python-api, requires Python 3, though there is a pull request for Python 2 support. No longer under active development by the original team. 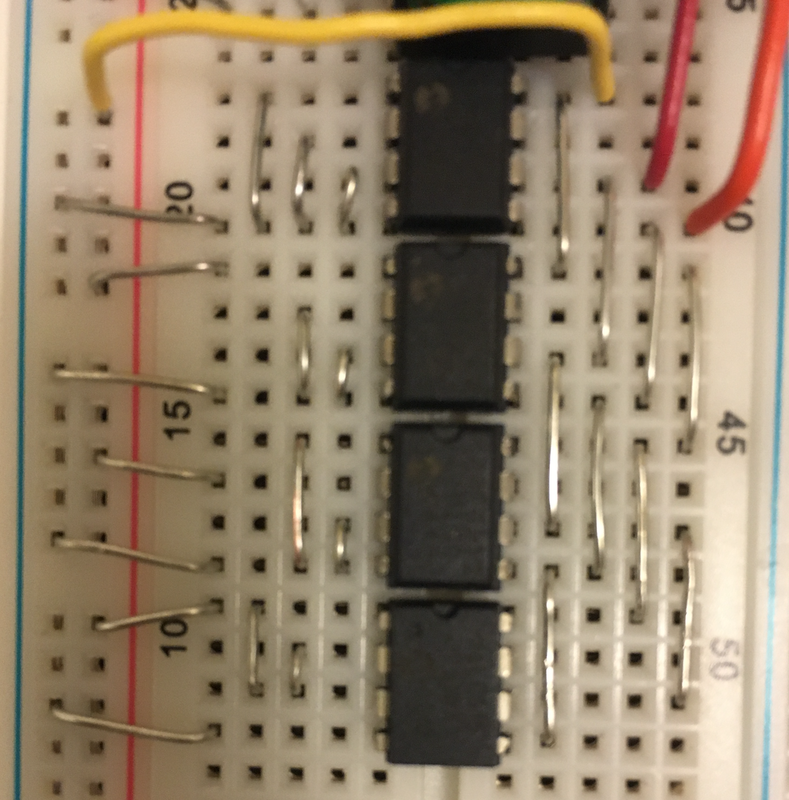 Pull-up resistors configuration? Hint from @johnty123: “sometimes you may have to explicitly enable the pull-up GPIO pins for the I2C bus on the RPi.”, what does this mean? 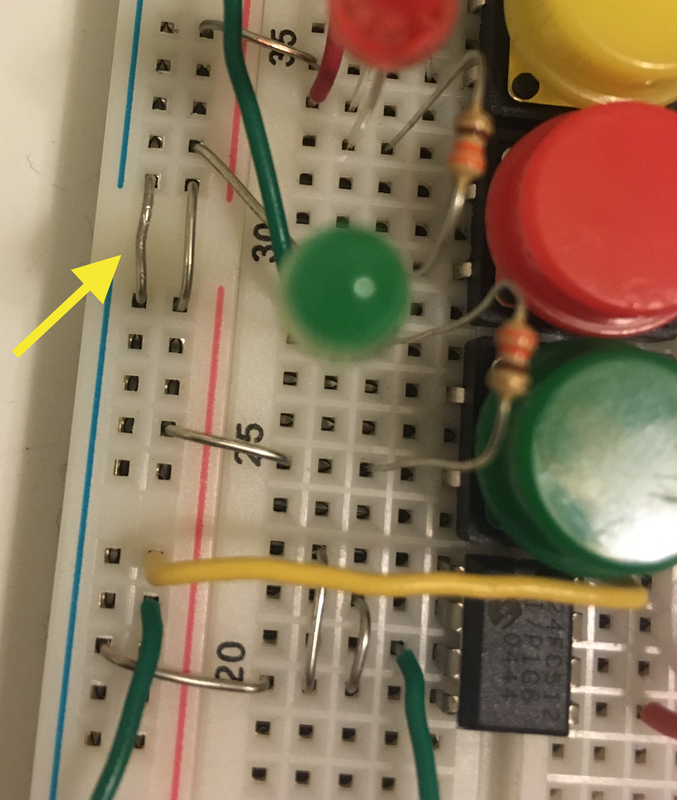 __main__:1: RuntimeWarning: A physical pull up resistor is fitted on this channel! although rebooting will restore these pin’s functions as well. What about adding physical pull-up resistors on the I2C data and clock? 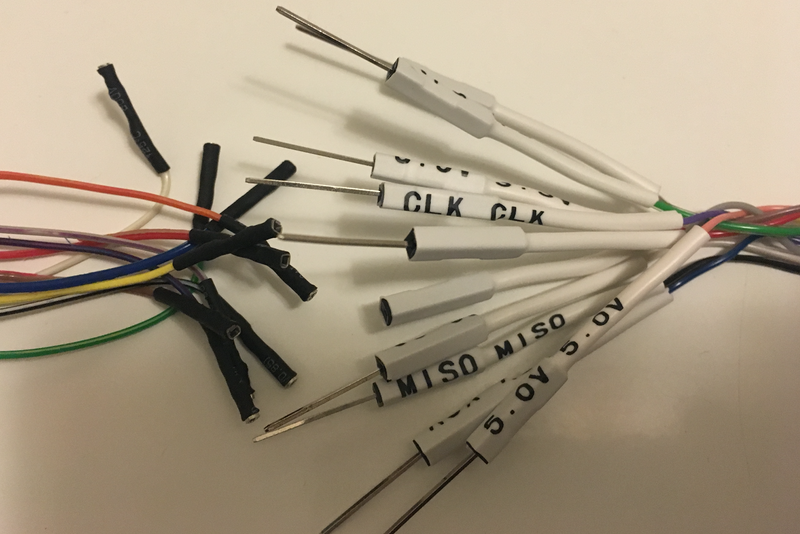 In i2c issue — attiny85, they used 4.7k pull-ups on SDA and SCL pins to 5v, but @dgordon42 says the Pi already comes with 1.8k pull-up resistors on the I2C bus 1 pins to the 3.3V power line, and to try without pullup. I’m not using any of my own pull-up resistors, and I didn’t try with any. /usr/bin/gpio vs /usr/sbin/i2cdetect? 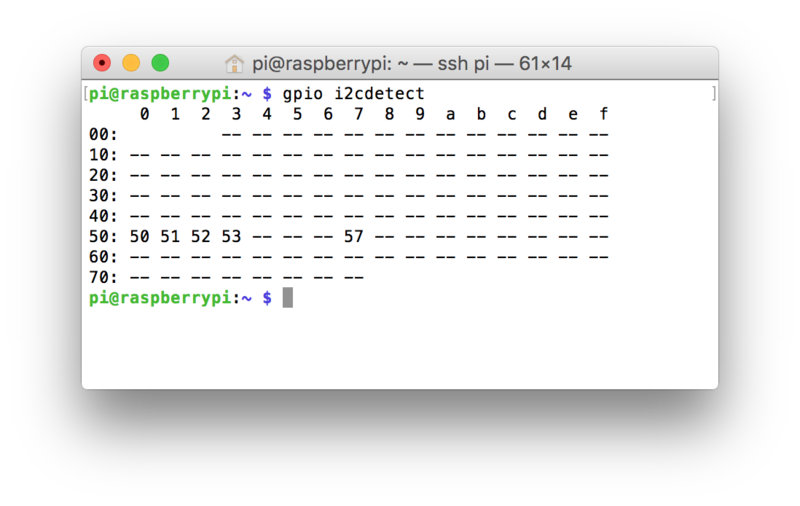 `gpio i2cdetect` and `i2cdetect -y 1` behave identically, but I made a habit of using gpio i2cd for brevity. First it detects the device at 6:50:00, then loses it for 1 second, then detects for only 4 more seconds. 62 seconds later detects again for 3 seconds, 97 seconds later for 1 second, 83 seconds later for 1 second, another 83 seconds later for also 1 second, 98 seconds then 4 seconds, a longer 122 seconds later and then detects it for a whopping 9 seconds, but then cuts out again for 45 seconds and only returns for 1 second (note that 1/s is the rate as which I scanned using gpio i2cd). Not nearly long enough to be useful. What is going on with this connection? To find out, I was about to setup the Bus Pirate’s I2C sniffer (the “(2)” macro in I2C mode) but I got as far as wiring up the ground connection from the Pirate to isolate the error. The breadboard has four separate pairs of power rails, two on each side. I used the left for GND/+3.3V and the right for +5.5V/GND, but the upper and lower sections of the grounds were not connected. Once this was fixed, the EEPROM’s ground pin was no longer floating, and the chip could be detected consistently using gpio i2cd. Sometimes it’s the simplest things that get you. This writes 0x0000 for the memory address, then reads back three bytes starting at that address. It should match the values written and read with the Bus Pirate (1, 2, 3). A useful characteristic of I2C is support for multiple devices on the same bus, distinguished by unique 7-bit addresses. The 24xx EEPROMs I2C device addresses always begin with 0b1010, but the lower bits can be chosen by wiring the A2/A1/A0 lines to Vcc or Vss for 1 or 0, respectively. The three ‘512 devices are straightforward, but the ‘515 as you may recall uses A2 as the “non-configurable chip select” pin requiring it to be 1, and in its place is the B0 “block select bit” essentially splitting the 512Kbit memory into two 256Kbits, here at addresses 0x53 and 0x57. It’s not fast (~24 seconds to read 64KBytes byte by byte), but it works. Writing the 16-bit memory address, followed by the data. The “[“ and “]” syntax starts and stops the I2C transaction. How to convert this operation to python-smbus? Read back with Python script (i2cset has an -r option to read back after writing, but it fails). To write with python-smbus, write_block_data() or write_i2c_block_data()? The former is for smbus, so let’s use the I2C variant. The write size is actually limited by the chip, 24LC515 documents “64-byte Page Write mode available” and 24FC512 “128-Byte Page Write Buffer”, that’s larger than python-smbus is letting us use, but oh well. Write in chunks. Note that writing beyond the end of the EEPROM will wrap around and overwrite the beginning; this script does not take into account the size of the memory and will allow this wraparound to occur. Alright we can write to EEPROMs, so what? How is this useful? Certainly not for expanding the storage of the Raspberry Pi. microSD flash is plenty adequate (at least the 16 GB class 10 card I am using), and adding (512Kbit*4)/8 = 256 KBytes of extra storage hardly makes a dent in the gigabytes of flash. Not to mention EEPROM read/write is significantly slower than flash memory (class 10 = minimum 10 MB/s). Why use EEPROM ever? One answer: small embedded systems, where only a small amount of (perhaps configuration) data storage is required, readily available at various parts of the circuit, not necessarily from the primary data storage mechanism. Raspberry Pi HATs are one such example. HAT = hardware on top, an expansion specification for the Pi. Plugs into the 40-pin header, and can make use of GPIO, I2C, SPI, and so on. But for plug-and-play interoperability, configuration data is needed: this is where the EEPROM comes in. HATs are required to have EEPROMs for this purpose. 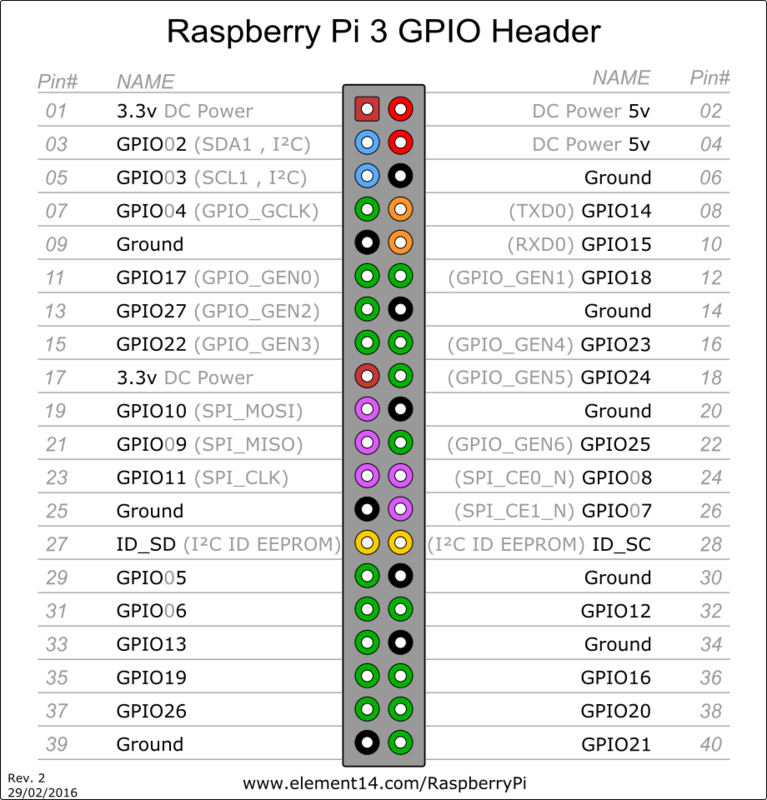 Sparkfun Raspberry Pi SPI and I2C Tutorial, i2c-0 for HAT is a good introduction. Additionally there are plenty of details in the official raspberrypi/hats repository, and a tool to flash. Interestingly, there is an eepromutils/eepflash.sh script, recently changed to bit-bang I2C instead of using the /dev/i2c-0 kernel driver. But I’ll use my own scripts developed above, connected to /dev/i2c-1, instead for now. To avoid the need for modules and applications to access the EEPROM, the VC bootloader reads the vendor, product and custom data and populates the /hat node of the device tree. This can be read by kernel modules using the standard DT API (of_*), or via /proc/device-tree/hat from user-space. Kits such as Adafruit Perma-Proto HAT for Pi Mini Kit — With EEPROM use an EEPROM. Why is it not showing up for me? Hint from Uso de EEPROM hats: read from /sys/class/i2c-adapter/i2c-0. No such file or directory, I only see i2c-1. it does seem odd to have to edit the boot configuration to enable a HAT, but it works. The HAT is successfully detected as configured by the EEPROM. The next step could now be to customize the HAT EEPROM configuration data further, enabling or disabling GPIO pins with various settings, adding device tree overlays, and so on, but not for this blog post.